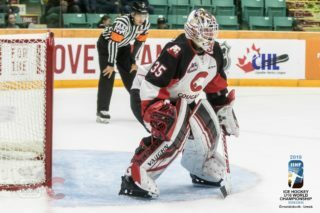 The Prince George Cougars may not have been in the post-season but plenty of former Cougars are or were in the thick of it in the WHL, NHL, AHL and ECHL playoffs. This weekly feature will provides updates on alumni until the end of the season. The Swift Current Broncos won their first WHL championship in 25 years Sunday, shutting out the Everett Silvertips 3-0 in Game Six of the Rogers WHL Championship Series in Swift Current. 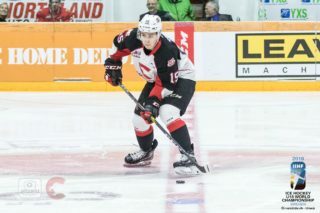 Former Cougar Josh Anderson anchored a shutdown defensive pairing with Sahvan Khaira, finishing the WHL playoffs with two assists in 26 games. 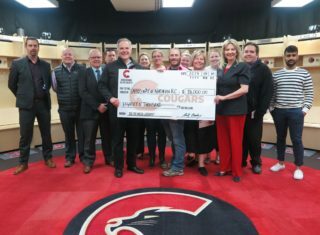 Anderson was drafted by the Cougars in 2013, 3rd overall, and played in 177 career regular season games over three and a half seasons, before being traded to the Broncos at the WHL Trade Deadline. Ethan O’Rourke played in 18 playoff games for the Silvertops, recording one goal and finished with a -1 rating. 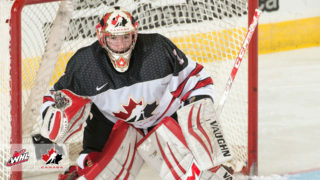 It was Everett’s first WHL Championship Series appearance since 2004. The Broncos are now off to the Mastercard Memorial Cup in Regina, which opens on Friday. The Broncos open their tournament Saturday against the QMJHL champion Acadie-Bathurst Titan. “Big Buff” had another big game for the Winnipeg Jets Saturday, in their 4-2 Game One win over the Vegas Golden Knights. Dustin Byfuglien scored the Jets opening goal (see above) and finished with two points. He leads all NHL defensemen in both goals (5) and points (15). Byfuglien and the Jets face the Golden Knights in Game Two of the Western Conference Final tonight. Brett Connolly and the Washington Capitals continue to roll. Connolly scored the Caps’ sixth goal Sunday (see above), in their 6-2 win over Tampa Bay in Game Two of the Eastern Conference Final. The Caps lead the series 2-0, with Game Three back in the US capitol on Tuesday. Connolly has had a solid spring thus far, picking up three goals and five points in 14 games; he’s got two points (1-1-2) in the series against Tampa Bay. The Calder Cup Playoffs are down to the final four, as the Conference Finals are set. Martin Marincin and the Toronto Marlies will face the Lehigh Valley Phantoms in the Eastern Conference Final, which starts Saturday in Toronto. The Marlies swept Troy Bourke and the Syracuse Crunch in their Eastern Conference Semi-Final series. Jansen Harkins and the Manitoba Moose Calder Cup playoff run is now over, aftering being swept by the Rockford Ice Hogs in their Western Conference Semi-Final series. Rockard will face the Texas Stars in the Western Conference Final. Troy Bourke’s season is still going, as he was transferred to the ECHL’s Adirondack Flames roster , the affiliate of the Syracuse Crunch, after their AHL season ended. Bourke made an immediate impact over the weekend, picking up two points (1-1-2) in the first two games of the Flames’ Eastern Conference Final series with the Florida Everblades; that series is tied one game apiece. Colin Jacobs had his season come to an end last week, as the Toledo Walleye lost out in six games to the Fort Wayne Komets in their Western Conference Semi-Final series. The Komets are facing the Colorado Eagles in the Western Conference Final. Dan Gibb (2009-2013) has signed one-year contract with Gap Rapaces in the France’s Ligue Magnus. Gibb spent this past season with the University of Calgary Dinos in U SPORTS men’s hockey. Chase Witala (2011-2016) signed one-year contract extension with Starbulls Rosenheim in the Oberliga (Third Tier) in Germany. Witala had originally signed with Rosenheim back in January. Prior to his move to Germany, he had played in the ECHL with Atlanta and Norfolk and had a brief stop in Slovakia.